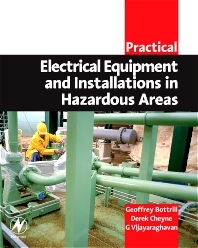 This book provides the reader with an understanding of the hazards involved in using electrical equipment in Potentially Explosive Atmospheres. It is based on the newly adopted international IEC79 Series of Standards that are now harmonizing and replacing older national Standards. Explosion-proof installations can be expensive to design, install and operate. The strategies and techniques described in this book can significantly reduce costs whilst maintaining plant safety. The book explains the associated terminology and its correct use - from Area Classification through to the selection of explosion-protected electrical apparatus, describing how protection is achieved and maintained in line with these international requirements. The IEC standards require that engineering staff and their management are trained effectively and safely in Hazardous Areas, and this book is designed to help fulfill that need. A basic understanding of instrumentation and electrical theory would be of benefit to the reader, but no previous knowledge of hazardous area installation is required. An engineer's guide to the hazards and best practice for using electrical equipment in Potentially Explosive Atmospheres. Fully in line with the newly adopted international standards, the IEC79 series. Clear explanations of terminology and background information make this the most accessible book on this subject.